Just across the street from the World Trade Center, St. Paul’s Chapel is known as “The Miracle Church” and “The Little Chapel That Stood.” Through the madness and terror and violence of that September morning 15 years ago, St. Paul’s Chapel stood. George Washington’s beloved chapel, complete with his beloved pew, stood. And this mighty little chapel, in the wake of it all, defiantly threw open its doors to those who would serve. There amidst the rubble and the ash and the pain, St. Paul’s Chapel became home to the most beautiful expressions of humanity – a shelter, a comforting home, a place of peace, and a witness to a powerful and profound ministry of healing. Truly, a church living its most sacred mission. 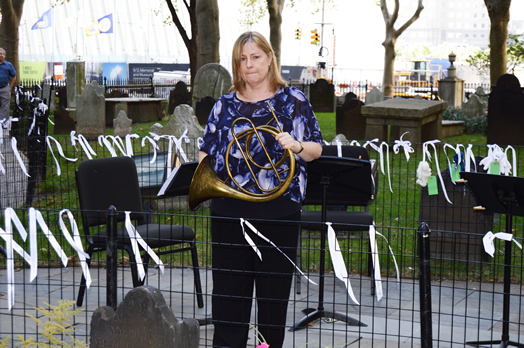 This year on Sept. 11, we returned to St. Paul’s Chapel for a “calling of the names” ceremony in honor and memory of those who came to serve after the attacks and who are no longer with us. 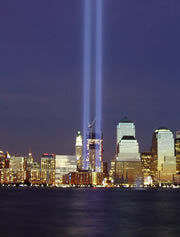 It was a bright Tuesday morning 15 years ago when the world changed. Some of us still cannot speak of that day when reason and hope and civilization itself crashed to earth in a wall of choking gray. This is our world? This is our reality? For so many of us, the only thing that we could do in response was to do what we knew – we went to work. For others, it was Get down there and support these extraordinary people doing this sacred work; hold them up, stand with them as their backs and heads and hearts ache and break from the strain, from the horror, from the creeping sickness. Love them, carry them, feed them. For they are truly our heroes. And so thousands came to work on the site, and thousands more came to serve them – doctors, psychologists, massage therapists, veterinarians, podiatrists, chiropractors, clergy, ordinary people serving soup, ordinary people offering blankets, offering a prayer, a poem, hot coffee, lip balm, a hug. And, alongside, and in support of them all – there were musicians. This is how our work came to be. There were musicians at the 69th Regiment Armory, where New York conservatory students brought Vivaldi and Andrew Lloyd Weber to mourning families; there were musicians at St. Vincent’s hospital, where nurses and doctors sat in silent grief for the patients who would never come; and there were musicians at St. Paul’s Chapel, healers all, giving of themselves to their neighbors, for months and months after that fateful day. And this blessed old wooden sanctuary quickly became home and family to those amazing people who would not, could not, stop digging, and to those of us who were called to serve them. It was “Danny Boy.” It was Bach’s Cello Suites. It was perfect strangers embracing as “America The Beautiful” gave way to “Hatikvah” and the dancing of a hora. It was the Vienna Boys Choir, Dishawalla, Dayna Kurtz, Raja Rahman, Judy Collins, Marina Belica, and my beautiful mother. It was my alma mater, Walnut Hill School for the Arts sending young chamber musicians. And it was my beloved colleagues, many of them members of Local 802, giving of themselves in the most heartfelt, simply beautiful way possible – to their city, to their nation. Three times a day, seven days a week, we brought relief to the relief workers, until the 9/11 ministry of St. Paul’s Chapel closed its doors almost a year after the attacks, on June 2, 2002. For those of us who took part in those months of volunteer music-making, we shall never forget what a tremendous gift it was to be there, doing our work for this community. And so this year, we returned to St. Paul’s for the calling of the names. Most of us who performed were original volunteers from 15 years ago. I was joined by flutist Joe Trent, French horn player Lisa Pike, cellists Kate Dillingham and Christine Gummere, and others who wish to remain anonymous. 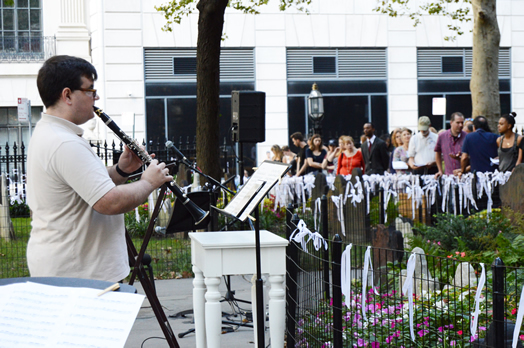 We also welcomed a new colleague to our community – clarinetist Kenneth Murphy, who played in honor of his firefighter uncle who had fallen with the towers. Volunteers from near and far called names – over 600 names in total, the beginnings of a list that will only grow. 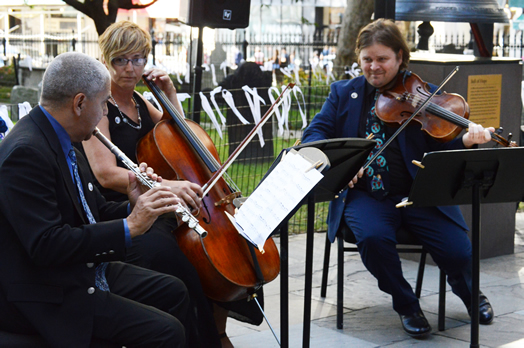 We played between the callings, to celebrate the lives of these people and the gifts of their extraordinary services. Please remember, the names we were calling were not of those who had died in the towers. Those sacred names are memorialized in the National September 11 Memorial & Museum. Instead, we were calling out the names of volunteers who helped out in the days after and who have since died. My fellow musicians and I were listening especially for three names. Three beautiful souls who held us all up with their music, their spirit, their love – and in our memories today. Bob McCrone, Lloyd Arriola and Mary Whitaker – our dear departed friends – we celebrated you! Your lives, lived in beauty, shine on and guide us; you live on now in blessed company with those who gave, as you gave, the finest our world has ever seen. You are all forever loved; you are all forever love. Thank you, Local 802 friends and colleagues. Thank you for your spirit, for your strength, for your music. You bring great beauty and healing to the world, every living day. 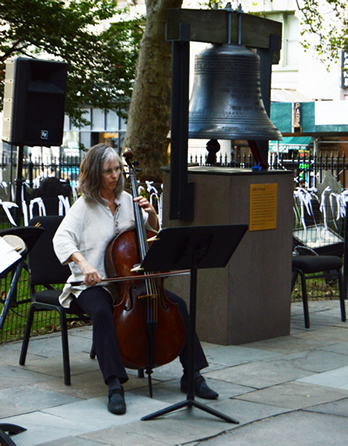 We are forever grateful to the brilliant musicians whose extraordinary efforts and leadership 15 years ago made our work at St. Paul’s Chapel possible: Audrey Axinn, Mary Bopp, David Gold, Elissa Kleeman, Brenda Landrum, Lisa Pike, Wolfgang Tsoutsouris, Jenny Undercofler, Jen Wu, Bob McCrone, Linda Emond, Elinore O’Connell, Niall Kelleher, and most especially Christine Gummere, whose inspiration to begin the music ministry at St. Paul’s opened the door to healing for us all. We also owe a massive debt of gratitude to Local 802, and I would like to name former President Bill Moriarity and former Vice President Bill Dennison, two gentlemen whose determination, savvy and compassion made it possible for so many musicians to be paid for their services at St. Paul’s Chapel. And finally, to the St. Paul’s staff who kept those blessed chapel doors open to us: Rev. Lyndon Harris, Diane Reiners, Sister Grace and Katherine Avery. Thank you, always. Ralph Farris has been a member of Local 802 since 1995. Photos below by Nina Roberts.